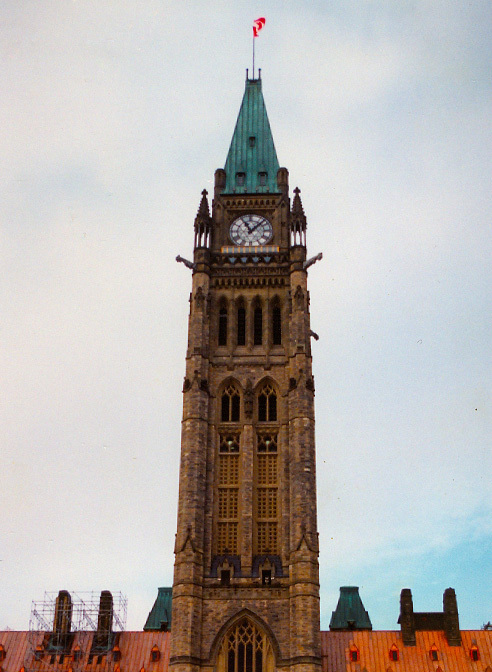 The historic Peace Tower in Ottawa, known to some as the Tower of Victory and Peace, is the focal point of the Centre Block of the Canadian Parliament Buildings. 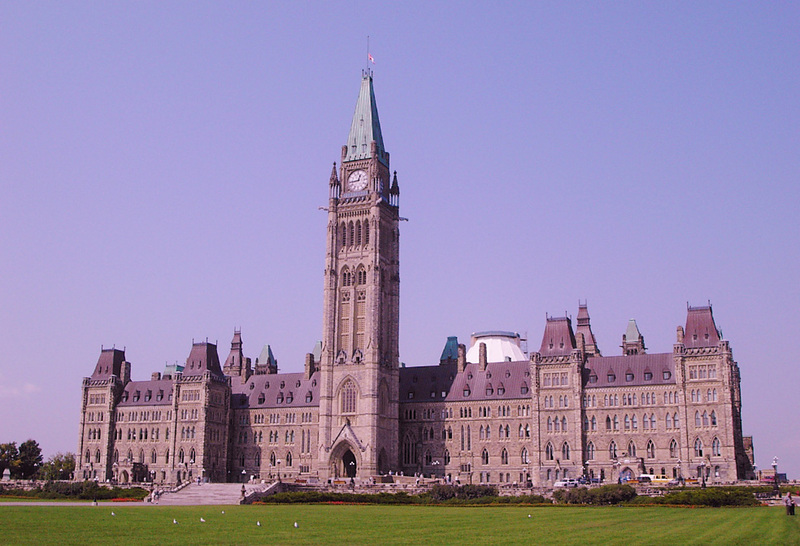 Designed by Jean Omer Marchand and John A. Pearson, the tower matches the Victorian High Gothic style that is evident in the rest of the Parliament complex. It stands at 302 feet and 6 inches tall, and includes 270 gargoyles and other ornamental designs. 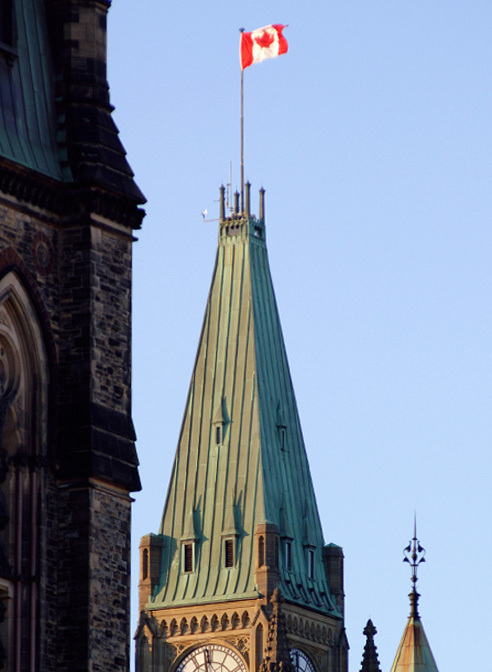 After years of harsh weather conditions and inevitable erosion, the copper sheet metal roofing covering the Peace Tower was in need of thorough restoration. Heather & Little was proud to partner with Colonial Building Restoration of Toronto, and Thomas Fuller Construction of Ottawa when taking on this historic sheet metal restoration project. When Heather & Little began this extensive sheet metal restoration work, an entire removal of the existing copper and sheet metal components was necessary. Once removed, a new air-vapour barrier and new wood battens were installed to get the structure up to modern safety codes. 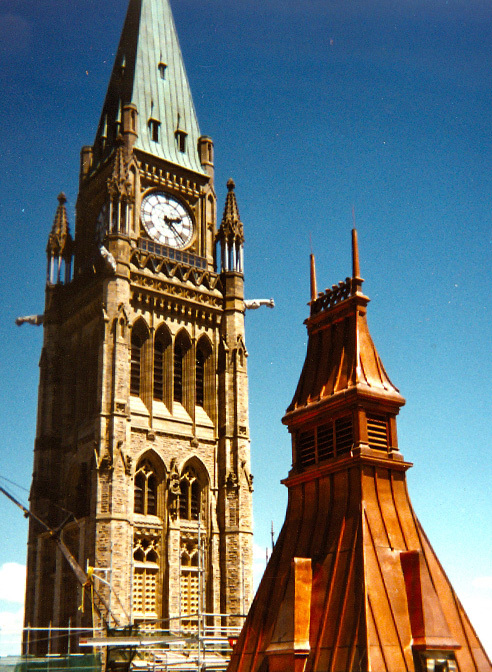 The original copper roofing was reworked to include newer seaming methods, and then reinstalled on the tower. The decorative copper cresting atop the tower was also removed and repaired to fix broken solder joints before being reinstalled. For this project, we used both 20- and 24 ounce coper sheets to match with the original materials that were reworked. All new and restored roofing was installed in the “batten seam” style. For more information on the sheet metal restoration on the Peace Tower, view the images below or contact us at Heather & Little today!